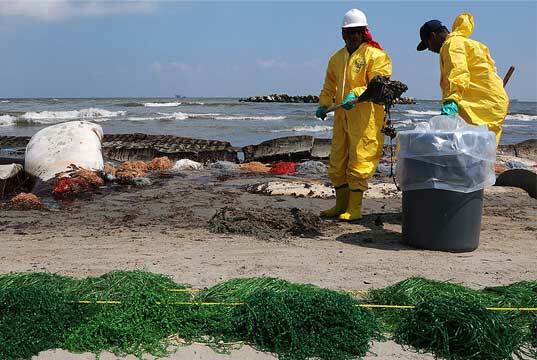 Contrary to what the media is telling you, a report from the Georgia Sea Grant and the University of Georgia released yesterday says that a whopping 79% of the oil from the Gulf oil spill still remains in the waters there. The report concludes that the media is way off in their estimates — they are saying that a mere 25% of the oil remains — and that the effects of this spill will be following us for decades while the oil slowly dissipates. The report notes that the large plumes of oil present deep underneath the surface of the Gulf are most likely still present and perhaps will be for years to come. “One major misconception is that oil that has dissolved into water is gone and, therefore, harmless,” said Charles Hopkinson, director of Georgia Sea Grant and professor of marine sciences in the University of Georgia Franklin College of Arts and Sciences. “The oil is still out there, and it will likely take years to completely degrade. We are still far from a complete understanding of what its impacts are.” The five prominent marine scientists involved in writing the recent report used information from the Aug. 2 National Incident Command Report, which the news media has also used to create their much lower percentage. The Aug. 2 National Incident Command Report has been widely misunderstood and the marine scientists involved in writing it used a series of calculations based on reasonable evaporation and degradation estimates to come up with their estimate of 79%. One positive part of this recent report is that the marine scientists involved discovered that a current called the Franklin Eddy is preventing the Loop Current from dragging oil into the waters of the Atlantic. So though the oil won’t be spreading to other oceans any time soon, it also won’t be disappearing from the Gulf. Though we were all enamored with the idea that perhaps most of the oil has dissipated, the sad truth is that it’s mostly still there. This catastrophe will be with us for years to come. It sounds good! Thanks for sharing. the key word being "eventually". as in, it'll take some time for things to normalize. the lovely thing is, this is only, heh, a drop in a sea of change. so before things are "clean" and calm, we'll be living on a planet that is changing ever-faster. as for the gulf being clean, that oil and dispersant certainly doesn't disappear once it leaves the gulf. until it moves on to wreak further havok, what damage will be done to the ecosystem? delicate food chains disrupted by death and pollution. lovely. finally, this oil is said to have stopped flowing, just as it's has been claimed 25% remained by the same people who mislead the public regarding flow rates. most likely that deception was deliberate, as those parties had things to gain. suppose they're lying about the effectiveness of their solutions to the flow problem. Reports from Alaska indicate that oil from the Valdez spill is still showing up after all this time. Even if it takes years for the oil in the gulf to dissolve it will only take one hurricane to move much of it onto land whether suspended in the water or lying on the previously sandy bottom. History show us that the Gulf of Mexico gets several hurricanes a year. So, we can bet on one thing: Mother nature will eventually clean her gulf!! Please do not stop telling the truth. Please. The link to the report actually points to someone's gmail account. please fix. The link for "Read the report here" goes to the Gmail sign-in page.